What is Regional Utility Service Systems Commission? The Regional Utility Service Systems, commonly referred to as RUSS, is a 7 county entity organized under Chapter 28E of the Iowa Code which permits state and local governments in Iowa to make efficient use of their powers by enabling them to provide joint services and facilities with other agencies and to co-operate in other ways of mutual advantage. Who makes up the Regional Utility Service Systems? 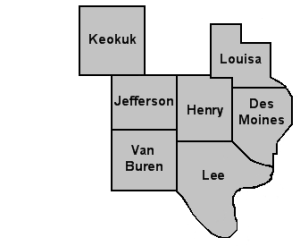 Participating counties in RUSS consists of Des Moines, Henry, Jefferson, Keokuk, Lee, Louisa, Van Buren. A county supervisor from each participating county serves on the RUSS board. Service on the RUSS board is part of the day to day responsibilities of the County Supervisors; therefore they receive no additional compensation for serving on the board. RUSS was created because very small incorporated cities and unincorporated clusters of rural homes were experiencing difficulties in securing certain essential services. This is due to the inability of small communities to plan, finance, own, operate and maintain the desired improvements. The creation of this organization was through the encouragement of financing entities, regulatory agencies and regional service providers. RUSS is now offering “Time of Transfer“ inspections for all 7 counties shown above. Please call Bruce Hudson @ 319-385-1223 to schedule an appointment, get pricing or if you have any questions. RUSS OFFICE HOURS: MONDAY – FRIDAY 8:00 a.m. – 4:30 p.m.